Mike Koehler doesn't have project funding or construction experience, but he wants to make this life-sized AT-AT walker a reality, dammit. It's a sad fact that these days, the USA just can't cut it in the global giant robot race. Japan has its Gundam statue and Tetsujin 28-go, South Korea is still planning its gargantuan Taekwon V, and even China has that ... thing ... in Sichuan province. But what do we have here in the States? Nothing, nada, zilch - unless the Statue of Liberty was really a coverup this entire time, that is. (Even then, it'd be on the French). Star Wars fan Mike Koehler dreams of changing that. He dreams of channeling nerd power into a force for good. He dreams of an AT-AT for America. In his manifesto linked above, Koehler calls upon the nerds of America to harness their "brain power, [their] manufacturing prowess, [their] organizational skills and [their] geek-fueled eye for detail" to create a life-sized replica of the AT-AT walkers from The Empire Strikes Back. He admits that he has no mechanical aptitude and no funding to get off the ground, but that's what group efforts are for. 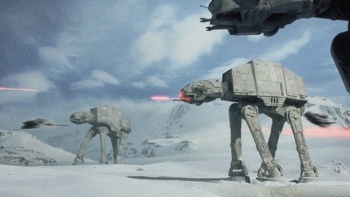 Plus, come on - wouldn't a full-scale AT-AT be awesome? Koehler's vision goes beyond the simple statues we see in Asia, though - he wants his AT-AT to be fully functional. I think that may be dreaming a bit too hard there, Mike, but don't let me stop you. Speaking with The Force.net, the Oklahoma City-based father of three said that he hoped to have "several build teams across the country" who would then come together wherever they decided to put the damn thing together. According to the AT-AT for America blog, funding site Kickstarter will be taking donations for Koehler's dream soon enough. But how much does an Imperial walker actually cost? Those things can't be inexpensive. Plus, if you ever actually did finish it, you know that Japan's giant Gundam would just come to life, fly over here and cut off its head or something. Ah well, best of luck to Mr. Koehler. You can keep up with the AT-AT project at AT-AT for America. Because yeah, as impractical as it would be? It would be pretty damn cool.